Washington police investigator George Klein Jr. collects evidence from one of the bullet strikes at the doors of the U.S. Holocaust Memorial Museum. 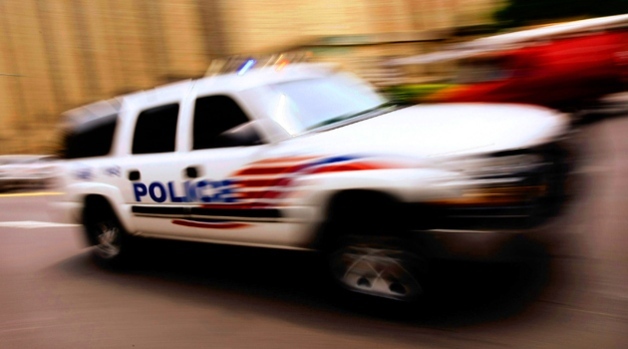 WASHINGTON -- The hero security guard gunned down at the U.S. Holocaust Museum came face to face with evil when he opened the building's doors out of kindness for his 88-year-old killer, officials said. The suspect, James Wennecker von Brunn, will be charged with murder in Wednesday afternoon's fatal shooting of special police officer Stephen Tyrone Johns, who law enforcement officials hailed as a hero who may have saved several lives. "He opened the door for the elderly man coming in," said Bill Parsons, chief of staff for the Holocaust Museum. 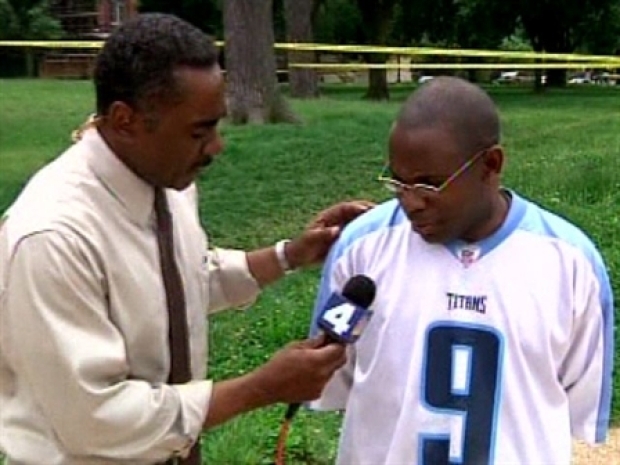 "He was caring about him, and he was shot." Johns was shot once in the upper left side of his chest. According to court documents, von Brunn continued through the door and raised his .22-caliber rifle, but two security guards shot him in the face, causing him to fall backward outside the door. Officials said 10 bullets remained in his rifle. Beside the charge of murder, von Brunn may be charged with a hate crime as more details emerge about his long and prolific trail of hate in the form of Web screeds, rants to family members and disturbing run-ins with neighbors, fellow artists and even federal bankers. 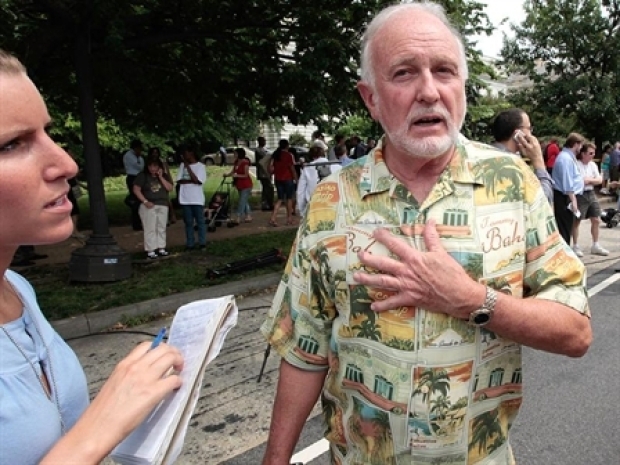 Von Brunn was on the radar of monitors of hate groups, having served six years in prison in the 1980s after an ill-conceived plot to kidnap Federal Reserve bankers and writing a self-published book, "Kill the Best Gentiles," detailing his hatred of Jews. The Southern Poverty Law Center told the New York Daily News it still kept an eye on von Brunn, but considered the octogenarian more talk than action at this point. But those who knew him described a loner whose anger had not dissipated with age. Former Senator and Secretary of Defense William Cohen describes the shooting at the U.S. Holocaust Museum. "He used to make the statement that he was going out with his boots on. I took it to mean that he was going to go out and try to take some people with him," his ex-wife told the Daily News hours after the shooting. "I'm in a state of shock, but I'm not surprised he did it." Von Brunn is still in critical condition at George Washington Hospital in Washington, D.C., where he is recovering from gunshot wounds. Von Brunn was shot in the face, and the bullet exited his neck, a police source told The Washington Post. Johns, the hero guard who tried to stop von Brunn during his rampage at the museum, died. A resident of Maryland who grew up in St. Louis, von Brunn has lived in New Hampshire and New York City and once listed a White Supremacist compound in Idaho as his address. Brainy enough to be accepted into Mensa, he ran a Web site called "The Holy Western Empire," on which he espoused his virulent anti-Semitic and anti-Christian views and his predictions of doom for whites. Mensa officials told the Washington Post he was dropped after failing to pay his dues. Von Brunn's Web site was his connection to other extremists and may have been the catalyst for the violent attack Wednesday. According to an acquaintance, von Brunn may have planned his outburst as a last hurrah before financial woes led to his losing his computer -- his link to the world of hate that fueled his deadly rage. "He said his Social Security had been cut and that he was barely making it," John de Nugent, an acquaintance who describes himself as a white separatist, told the Washington Post. "He felt it was the direct result of someone in Washington looking at his Web site." Neighbors told the Post von Brunn would often offer his unsolicited opinion that the Holocaust never took place. In regular e-mail blasts to a group of white supremacists, his diatribes were even more sinister: An online trail shows he began using cryptic language in his blasts weeks ago. One message told readers that they shouldn't expect to hear from him anymore and another said "it's time to kill all the Jews." A fairly accomplished artist, von Brunn had a creepy encounter with the owners of the Troika Gallery in Easton, Md. They said von Brunn stormed out angrily after they turned down his request to show his art, telling the hulking 6-foot-5 von Brunn it was not up to their standards. They said they saw him lurking around the gallery occasionally in the ensuing years, and that once, he bitterly complained that a mixed race couple had gotten married there. 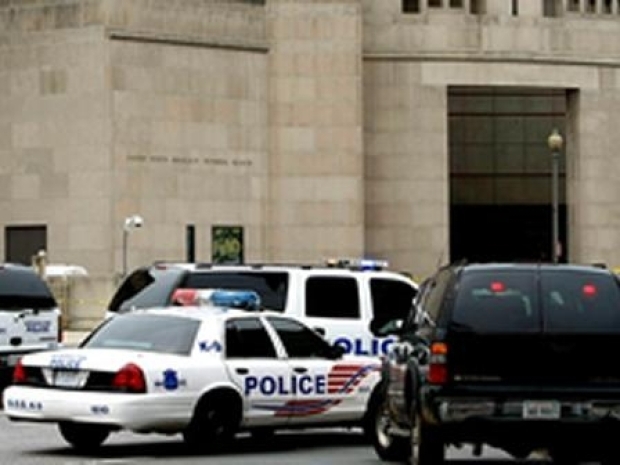 The suspect in the Holocaust Museum shooting is charged with first-degree murder. The museum wasn't the first time von Brunn used violence to enforce his views. In 1983, von Brunn was convicted of attempting to kidnap members of the Federal Reserve Board and served more than six years in prison. He was arrested two years earlier outside the room where the board was meeting, carrying a revolver, knife and sawed-off shotgun. At the time, police said von Brunn wanted to take the members hostage because of high interest rates and the nation's economic difficulties. Just as chilling as von Brunn's history was what he had planned for the future. When officials searched his vehicle they found numerous documents that contained names and addresses. 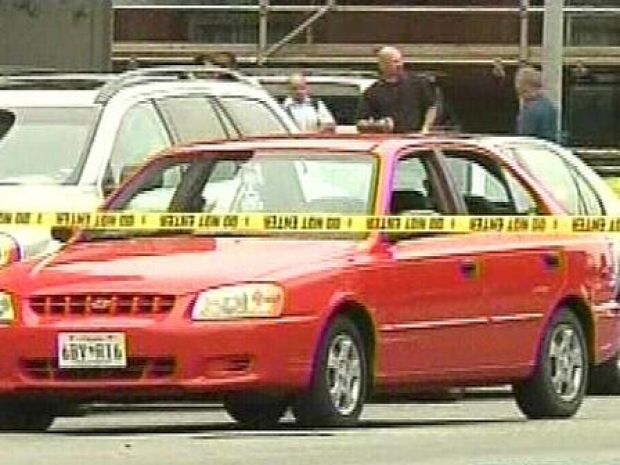 A list of D.C. locations -- including the National Cathedral -- and more ammunition were found in the double-parked vehicle, NBC News reported. The purpose of the list was not immediately clear, an official said. A law enforcement official told the Associated Press the list included names of lawmakers on Capitol Hill. "If there is a name or address that we recovered from that vehicle, those names and addresses have been contacted," said Joseph Persichini, Jr., Assistant Director in Charge of the FBI Washington Field Office. "We have exhausted all leads from them." A suspected hatemonger shot and killed a securtiy guard at the Holocaust Museum Wednesday afternoon. Officials said they also found a notebook that had handwritten notations stating the following: "You want my weapons -- this is how you’ll get them. The Holocaust is a lie. Obama was created by Jews." The notations continued with more hate messages. Police searched von Brunn's Annapolis, Md., home for more clues about the attack. He rented a room in an apartment he shared with his son and his son's fiancee, according to court documents. They found .22-caliber ammunition and a 30/30 rifle, as well as manuscripts, ledgers and journals. His extensive amount of digital data could yield key information, officials said. 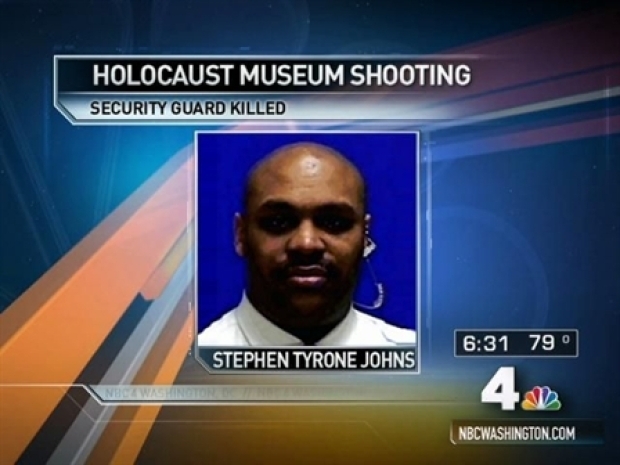 "There are no words to express our grief and shock over today’s events," said Holocaust Museum Director Sara Bloomfield, adding that Johns, a six-year veteran guard at the museum, "died heroically in the line of duty." People who were at the Holocaust Museum share their experiences during and after the shootings Wednesday afternoon. Bloomfield said the museum would be closed Thursday in Johns' honor, and flags would be flown at half staff -- as the White House condemned the latest act of domestic terrorism. The Holocaust Museum normally has a heavy security presence with guards positioned both inside and outside. All visitors are required to pass through metal detectors at the entrance, and bags are screened. It was unclear if the shooting took place before or after von Brunn passed through the metal detectors, according to Park Police. 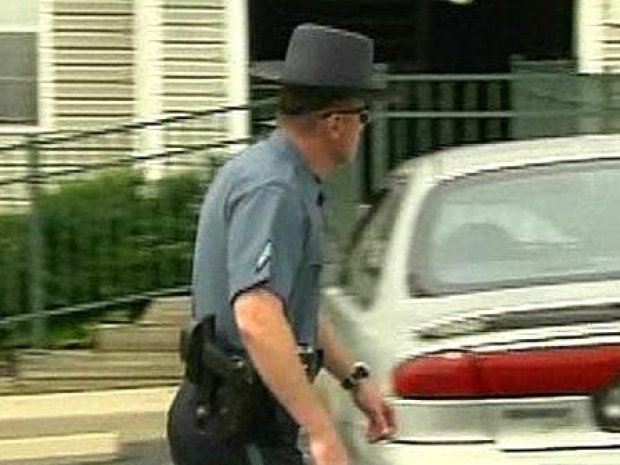 Police are at the Holocaust Museum gunman's Annapolis home searching for clues. Former Senator and Secretary of Defense William Cohen was just inside the door of the Holocaust Museum when the shooting took place, NBC News reported. He was waiting for his wife, Janet Langhart Cohen, who has written and directed a one-act play that was to be performed at the Holocaust Museum Wednesday night. The performance is now being rescheduled for Thursday evening. Langhart Cohen's play is called "Anne and Emmett;" an imagined conversation between Anne Frank and Emmett Till. It was being performed as part of a commemoration of the 80th anniversary of Anne Frank's birth. "This is what the play is about," Cohen said. "It's about hate." The Holocaust Museum gunman and his victim both were taken to George Washington University Hospital, where the victim died. The American Jewish Committee also is working on a contributions link on its website. 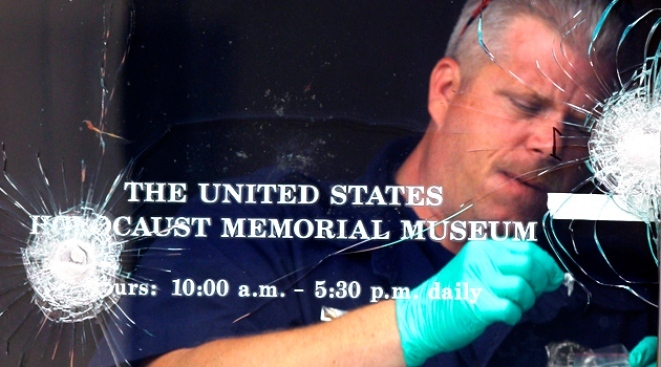 An eyewitness describes the shooting inside Washington's Holocaust Museum.